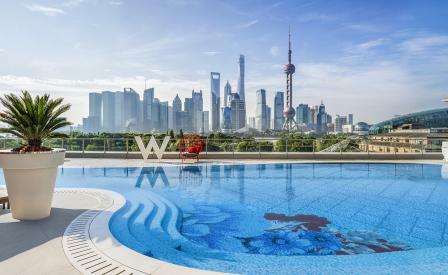 On Shanghai’s North Bund, in a low-key but up-and-coming district, the new W Hotel’s location might not yet fit with the brand’s buzzy ideal, but what the neighbourhood lacks is more than made up for inside. Global firm G.A Design and Melbourne-based Fabio Ongarato Design have cannily created a sense of place without slipping into obvious clichés. As such, light-filled atriums with vertical neon installations nod to the jumble of laundry often seen hanging in the city’s narrow laneways. Metal accent walls reference the brickwork of traditional shikumen houses and, playfully, each of the 374 rooms has a giant pair of chopsticks and a pillow in the shape of the city’s famous xiaolongbao (soup) dumpling. Diversions include the AWAY spa, a gym with a spin studio and, for gourmands, there are five dining options, including YEN, which serves up modern Cantonese fare. Thanks to the curvature of the building, nearly all rooms have spectacular views of the city, but for the full, pulsing, W experience don’t miss a sunset cocktail at the hotel’s pool and surrounding WET deck, which is perfectly located for prime skyline viewing.